I've realized that moving feels a lot like taking apart your life piece by piece in order to put it back together somewhere else. You quit your job, pack up your things and divide your life into digestible nuggets that are transportable. I just worry whether or not I’ll feel whole again. You chip away at the things that make you who you are in this life in order to start a new one. Watching myself take down our family photos from our walls seemed surreal. Leaving the home that I loved so much is hard. It’s our little piece of NYC, and I'm going to miss it. I know that it's all for the better, but I can't help getting sentimental at these things. These are the weird thoughts that keep me up at night. I think I think too much...from Instagram photos to recipe ideas and now what pieces of my house will fit in what boxes, this new life is consuming me and it’s only been 4 days! 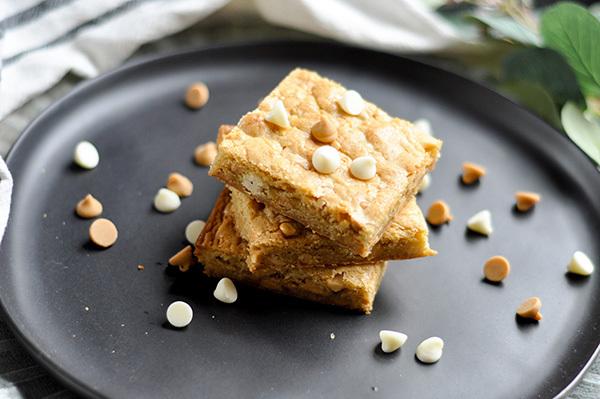 But as I chip away at my life here in NYC, I wanted to share with you this recipe for Peanut Butter "Chip" Blondies. Don't you just love food segues! ?